We are all aware that an important aspect of life is making choices. We make some wisely and others perhaps not so wisely – and then have to live with the consequences! Those consequences can range from temporary (when the decision involves a minor issue) to those that have a lasting and profound impact on our lives. Among these are those that affect our careers, our finances, our health and longevity, our friendships and other important social relationships. you enjoy, but whose politics, friends, or mood swings you find at times exasperating? Should you express a firmly-held ethical or political belief to an audience whose support you value, even though doing so might result in rejection? These are but a few of the many examples that could be mentioned. I’m sure you could think of lots of others! Living creatures are also “decision-makers” but their choices are usually made without knowing why and with no appreciation of the consequences*. They are driven by variation between individuals in their competitive abilities, used to acquire the necessities of life (food, shelter and mates). Natural selection distinguishes between individuals that for one reason or another make good or bad competitive decisions. The prize goes to individuals that most efficiently convert food to offspring. Darwin called these individuals the most “fit”. Their offspring become most common, replacing those with other traits that make different choices. Figure 1. 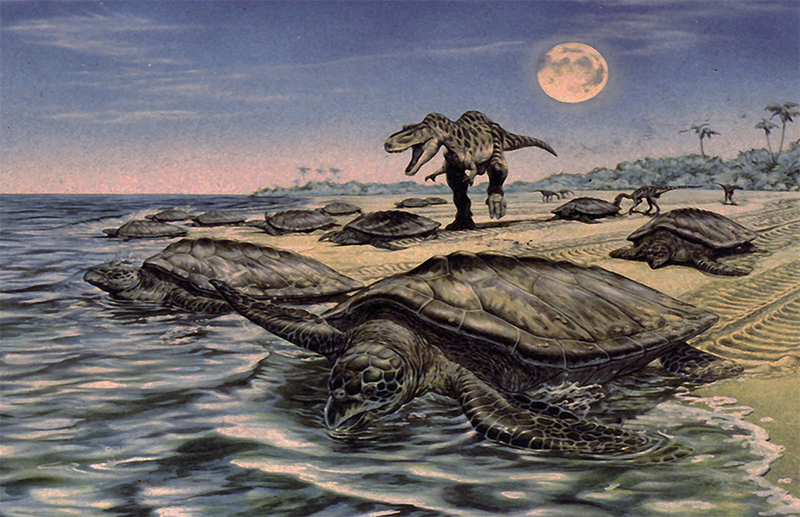 Artist’s rendition of a scene from a sea turtle nesting beach that took place about 80 million years ago. Several Archelon, the largest marine turtle that ever lived, are being chased off the beach and into the water by a dinosaur (T. rex) that may have been an important predator on both females and their nests. Some smaller predators in the background may be eating the eggs. We call the changes that result from this process evolution, and we can safely conclude that those organisms around today are the progeny of organisms that in the past made “correct” decisions. At the same time, biologists recognize that while evolutionary change is characteristic of life, it is also without any purpose other than to perpetuate the offspring of the most fit individuals, generation after generation. Whether by doing so the outcome is “good” or “bad” in terms of any human values is of no consequence in the natural world. *Especially intelligent animals like some birds (parrots, crows and their relatives), some primates (monkeys and apes), porpoises and octopuses may be exceptions. belonged to 4 groups of “modern” marine turtles, with well over 100 species. Today, two of those groups are extinct and we are left with the remnants: 6 species in one group (the “hard-shelled” sea turtles) and a single species in the other (the “leathery” turtle which lacks a hard shell). Nevertheless, these 7 surviving species provide a glimpse into the diversity of shapes, sizes, habits and exploited habitats of this formerly much more diverse assemblage of species. The changes that occurred were so striking that we can describe them with confidence as characteristic of all the marine turtles, including those currently extinct. We will focus on three questions. What were the evolutionary decisions that transformed a terrapin into a marine turtle? What were their unintended consequences? And what environmental pressures shaped the similarities and differences among the species? Marine turtle shells also decreased in thickness to reduce weight and changed in shape to promote streamlining. A consequence of those further modifications was that soon even the limbs could no longer be totally protected. But that was just the beginning! Terrapins may be slow but they can get around on land. They are quite effective at finding places to hide their eggs, placed in underground nests, from predators. Contrast that with a marine turtle using its flippers to crawl up a beach – a truly difficult and awkward task! Distance is minimized and sea turtle nests are anything but hidden, even though the last stages of nesting involve scattering beach sand to mask its exact location. The implications..? In a word, profound! Many nests are lost to raccoons, pigs, wild dogs and armadillos; others are washed out by high tides associated with storms or hurricanes. To compensate, marine turtles had to increase the number of eggs they placed in each nest, the number of times they nested during each breeding season, or both. That could only be done by increasing body size so enough fat could be stored to produce all those eggs, and enough space was available to temporarily store them. It’s no surprise, then, that marine turtles are large, in fact they are among the largest turtles rivaling in size some of the biggest land tortoises. And finally, because both females and their nests were so vulnerable on land, marine turtles could only succeed in reproduction if they nested at remote locations, those where they were unlikely to be attacked by predators (Figure 1). Those sites were often not near locations where they could find food and so females had to migrate long distances between their foraging grounds and suitable nesting beaches. Those beaches were often on islands in the middle of nowhere! Satellite telemetry studies have shown that the turtles complete these journeys, often by swimming in a straight line across what are to humans, featureless ocean basins; it’s clear that they know where they’re going! 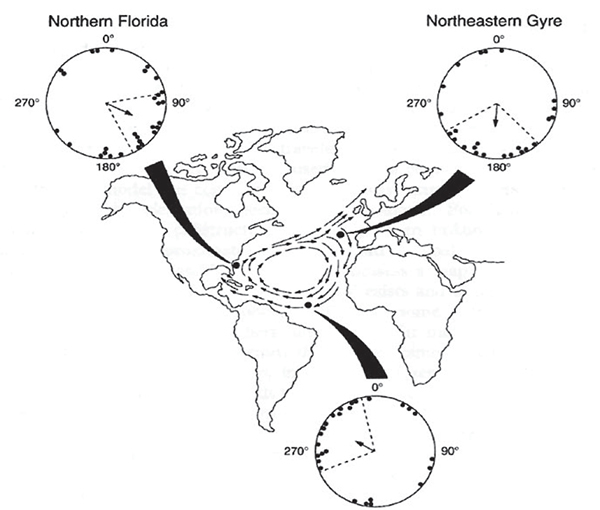 Such a capability requires a sophisticated navigational sense, and all marine turtles had to evolve “maps” that to accurately achieve these journeys. Even hatchlings, which must migrate from nesting beaches to distant oceanic nursery sites, possess an effective GPS so that when they first enter the sea they know exactly how to reach distant migratory goals (Figure 2). These two species are characterized by their speed and maneuverability, which they use to avoid their predators. Both species are also composed of populations that show strong fidelity to particular nesting beaches, and so navigate with great accuracy between those sites and their preferred foraging grounds. like those of most other marine turtles, are small and vulnerable. To avoid predators in coastal waters, they migrate out to sea until they grow large enough to safely return. 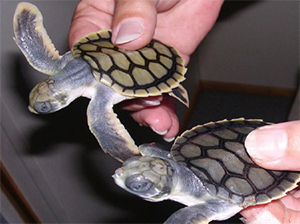 Flatback hatchlings, however, never leave coastal waters. How did those differences arise and how can flatback hatchlings survive? The answer may be that the ancestors of flatbacks nested with great fidelity only on Australian beaches. That continent drifted away from Antarctica about 130 million years ago and became isolated from the rest of the world. Isolation occurred before the placental mammals evolved and until humans, some 40- to 80,000 years ago (More precise dates aren’t available.) introduced rats and dingoes to Australia, all of the mammals there were a unique assemblage of marsupials (except for a few bat species). Some marsupials were predators but apparently none posed a serious threat to a nesting sea turtle or her nests. In such an environment, an ancestral flatback could explore a unique reproductive tactic, at least for a marine turtle. 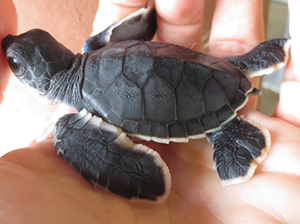 Instead of producing many small eggs that developed into lots of small and expendable hatchlings (like green turtles), ancestral flatbacks could produce fewer, but larger, eggs that developed into large hatchlings better able to defend themselves from coastal predators (Figure 3). 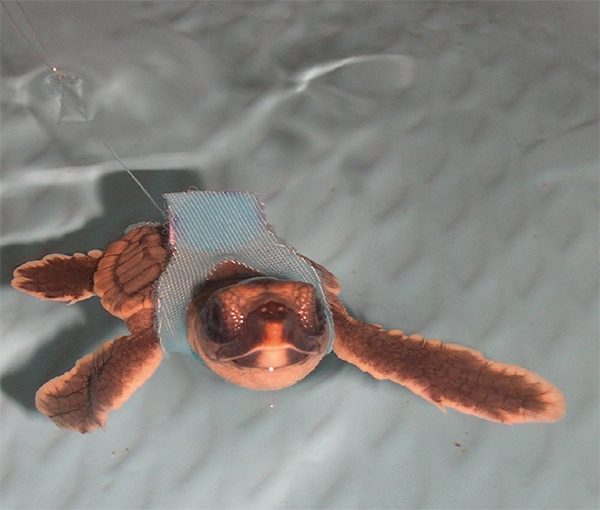 That made it possible for hatchlings to avoid a costly and dangerous seaward migration. But that evolutionary “decision” could only work in Australia, which is why the flatback, in contrast to all other marine turtles, has such a limited geographic distribution.